Healthier lifestyle choices lead to more productivity, less stress and a happier, more successful you. Where to begin? Why not start from the comfort of home? Here are three amazing ways a hot tub can change your life. Release Built-up Stress – Tension pain can leave you irritated and cranky. Luckily, a hot tub offers stress relief in under twenty minutes. With high heat, massage and soothing water, a dip in the family spa rids the body of stress for a refreshed, rejuvenated you. Spend Quality Time With Loved Ones – A hot tub at home makes it easy to spend time with busy family members at the end of a hectic day. Create an exciting family night with a movie under the stars and create memories that last a lifetime. Restore, Recharge and Rejuvenate – A quick dip in the family spa is just what the doctor ordered to recharge mentally and physically—opening doors for a happier, healthier you. Over time, a nightly dip in the hot tub will promote deep, relaxing sleep too, for a fresh, alert morning. 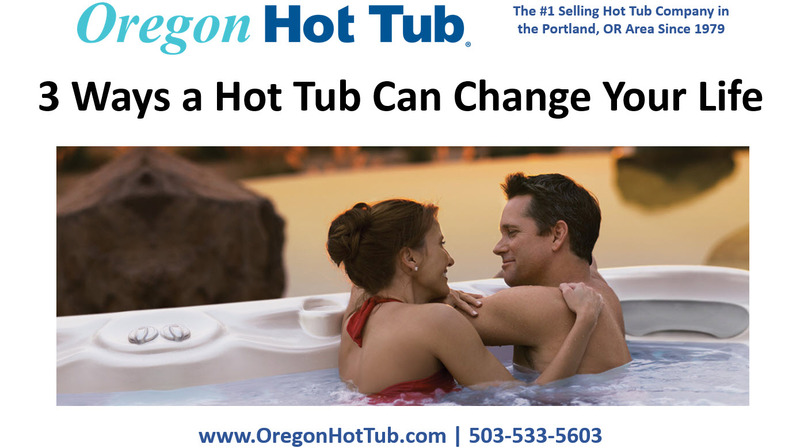 To encourage local residents to check out the benefits of owning their own hot tub, Oregon Hot Tub will be providing free hot tub test soaks for the entire month. We do recommend, however, that people wanting to schedule their free 30-minute test soak call us ahead of time to reserve their spot.